When I’m playing a game against zombies or robots, or really any faction, when my opponent starts going after a certain base, I put down a low level minion or two, and then just play somewhere else. Unless it’s the mall or the factory. Force them to use up a lot of minions to take a base while you go after a different base. When the base scores a lot of them will clear off and you will have the advantage on one or both of the other bases. It’s true zombies will be able to play from discard, but it takes them a while to get rolling again and hopefully you have locked down the other base(s). This can be frustrating to the opponent and a lot of times they stop playing on the base they were going after and try to go after you, but hopefully you can destroy, or move away their minions, but at least you have that head start on scoring. Aliens excel at sending characters back to their owners’ hands. This may seem a little weak at first, as you spend event cards to do so as you slowly build up one alien at a time. But consider the following: Why not send your own guys back? After a few scores in the game, you’ll probably have some points. Ideally you’ll be winning, but even 2/3 of the way is fine. Now’s the time to start playing your Alien Invaders. 1 VP every time. Then what? Abduct them back to your hand. Then play them again. Rinse and Repeat. Whenever we play smash up with new players we let them pick their first faction so that they start the gaming experience with at least one part of the team they want, and it makes for a more positive start. So in a 4 player game with 2 new players, we would allow the 2 new players to grab lets say Ninjas and the other person Zombies, after that we would do our random deck drafting for the rest of the factions to keep it more of a strategic atmosphere. To help breakdown overpowered faction combos and allow for a unique strategy straight from the get go. Take a card from each faction and shuffle them together into a single deck. Have each player draw two cards, and then have everyone pass one of those cards to their right/left(however you want to play it). The two cards each player is left holding are their factions. This gives people the chance to mess with each other before the game even really starts, which is what SmashUp is all about anyways. As an alternative to choosing faction in the rulebook, a house rule I sometime use is to gather 1 card of each faction and shuffle them together and deal them to each player until all factions are given. Depending on number of players, each player gets to decide which faction he wishes to play with and discard the excess faction cards. This way, players tend to argue less when choosing factions. Home World – Build up on the base by dropping tons of minions with power 2 or less, and then change it into Rhodes Plaza Mall. You should score a bit of points using this tip, more if you’re playing Robots, or Aliens/Wizards. Anything – Let other players fight it out for a base, and when they’re close to scoring the base transform it into the Jungle Oasis. It will only give the leading player 2 points, and any others a big fat zero. Something we’ve started doing is flipping all of the decks upside-down, then each player picks up three and chooses which two they want to keep. This usually prevents players from taking overpowered combinations, and also forces everyone to try new strategies rather than rutting themselves into the same factions every time. Ever since we got this game we have always decided the factions by taking on of each, shuffling them, and then dealing out two to each player. At first it was because we didn’t know anything about them, but now we find that it balances things out nicely. Also no hard feeling about no one getting their favourite team! Even if someone gets lucky and gets a strong team, it such a short game that it’s not a big deal for us. Just brings us back again to see who gets what! @gamerbling already mentioned this, but after playing Smash Up with every amount of supported players I found that I agree enough to mention it again: try less bases. My gaming group prefers three and I really believe this is the best number of bases, whether you’re playing 2-, 3-, or 4-player Smash Up. One of the usual criticisms of the game is lower player action than the players anticipated. If your group doesn’t have this problem, awesome! Unfortunately mine did. With 2-player there really isn’t a problem. Bases = number of player + 2. Just like the rules say. But with 3- and 4-player games we started to see a huge increase in turn duration. We played 4-player with five bases (like the rules say to) and the game lasted almost an hour and a half. Honestly we were exhausted and it was a few months before I could pick it up again. Using three bases speeds up gameplay, there is less downtime while someone ponders all the bases and all their cards, and you get to see more of the bases. Now, it obviously depends on the factions in play and how people play their cards, but I have noticed that decreasing the number of bases helps my gaming group without skewing the game itself. And that is a credit to the game itself! We often play Smash Up as a two player game to 20 VPs instead of the the normal 15. It lengthens the game and adds a little more strategy to the end game. It lets the players set up a few more minions and think a little further out. A standard 2 player game is won in 5 bases or less. This extends it to approximately 7 bases. Play Trixter Pirates and place all your Gremlins on one location. Broadside them and draw cards while your opponents have to discard. If you do this at the Base where each Minion destroyed gives its owner 1 XP, even better!!! 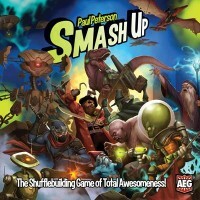 Smash Up is all about getting more minions and power in each base than your opponents does. Robots are a great faction for this because 18 out of their 20 cards are minions. There are several robot minions that allow you to play additional minions, and the microbots, in particular, work to boost the power of other microbots. This can provide a great deal of power per base. The downside of 18 minions is that there are only 2 action cards. This is where the wizards come in. The minions for the wizard faction aren’t very strong, but the wizards are all about card draws, extra actions, and playing extra minions. When combined, robots and wizards make an excellent team, with the wizard card draw and events allowing for the playing of the more powerful robot minions. At the time of this post, there were two other tips for this game. One saying that Aliens are good because you can beam up your invaders and us them multiple times. The other said that wizards were good for card draw and robots were good for playing multiple minions and powering each other up. Well, I’m here to say that zombies and any of these three factions are incredible. Zombies and any faction, to be honest. Zombies have cards to play minions from the discard pile or bring minions from the discard pile back into your hand. This makes replaying Invaders even easier for more VP. It also benefits from the card draw of Wizards as well as the additional actions(which robots may not be able to use easily). They also have Tenacious Z, basically a free minion any time you have a copy in your discard pile. If you draw Mall Crawl, I would use that to put all your Tenacious Zs in the discard pile. Zombies for life, because replaying your power minion from the discard pile repeatedly is good with any faction. At the end of the game, you must of course sort the cards back into their respective decks. But with full art and occasionally similar frames, this can be kind of slow. Gamer Bling has found that the quickest way is to do this is to turn the cards upside down (not face down, but upside down). This way you can sort by the distinct shapes of the decks’ icons. The icons are also placed against the card frames, which makes the differences between the decks very clear to see. When reading about Smash-Up on other sites I see players who seem to think Dinosaurs, Cyber Apes, Bear Calvary, Robots, and zombies can be over powered when paired with another in that group. But you do not need one of these factions to win! For example, playing against robot-zombies? Don’t necessarily try to out muscle. Try aliens and pirates. The pirates can send a ton of robots to the discard and move tons of minions away, while the aliens will send tenacious z’s back to the hand, or swap out bases at the last second. Additionally, the first mates will stick around after a base scores, so you have a good shot of getting a head start on the next base before the hordes come. Robot-Zombies were whipped in a match up like this a few times, and against other factions like the secret agents. What I’m trying to say, is yes, some combinations are easy to play with and hard to beat. But there are combinations that are really powerful against those powerful combinations. Keep playing against those challenging combinations and you will find your own pairings that will work. In the process you will find better strategies that will make your game more consistent. If you are not picking randomly, then pick wisely!